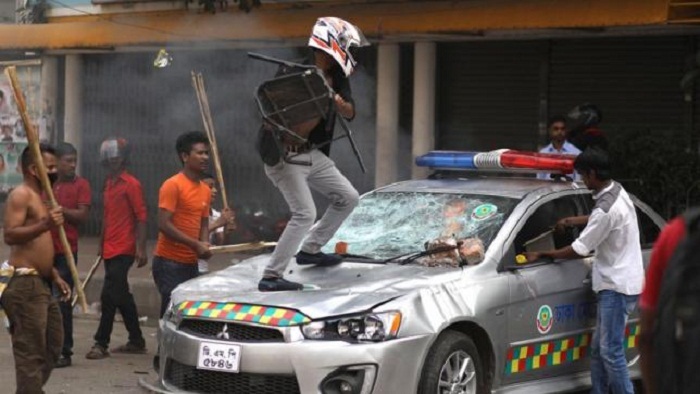 The youth, who allegedly torched a police vehicle during violence in front of BNP’s Nayapaltan Central office on November 14 last year, gave confessional statement in a case filed for vandalizing Awami League election campaign office in Pallabi. Wasim, 28, gave confessional statement before Metropolitan Magistrate Mohammad Jasim Uddin after being produced before it by Sub-inspector Munshi Shahidul Islam of Pallabi Police Station, also the investigation officer of the case. Earlier on Thursday, Police arrested Wasim from Pallabi Bihari camp in a lawsuit filed over torching an Awami League election camp in Mirpur. The magistrate sent Wasim to jail after recording his statements. Wasim was also wanted in the case filed over torching a police vehicle during violence near BNP’s Nayapaltan office back in November last year. Wasim went into hiding after the video footage, depicting that he was torching police van with fire box stick during the violence, went viral.